Shelley Pineo-Jensen, Ph.D. is a social justice activist / public intellectual who uses the nickname "Dr. P-J" in social media communications. Dr. P-J's scholarly interests include statistics, quantitative and qualitative methods, power structure analysis, Gender, Queer and Critical Theory, labor studies, standardized public education, and voter suppression. She took a degree in Educational Methodology, Policy, and Leadership from the College of Education at University of Oregon in 2013. Her dissertation, An Informed Electorate: The Relationship Between the Standardization of Public Education and Voter Participation, is available at Amazon. I have been active in the Democratic Party since before I was old enough to vote, when I volunteered for Bobby Kennedy’s presidential campaign in California. I have been a volunteer in almost every election cycle since that one, including being a delegate for Jesse Jackson and the Rainbow Coalition at the Colorado State Convention. I have made thousands of phone calls, knocked on hundreds of doors, been a poll watcher several times, and worked in campaign offices performing the tasks that needed to be done. I currently administer the Fredericksburg Democratic Party website and help moderate our Facebook page. I am on the Resolutions Committee for our Congressional District and have written a resolution about ending superdelegates. Before attending graduate school, Dr. P-J served as a public school teacher for ten years, nine of them teaching fifth grade. Before that, she was a stay-home mommy for over ten years, raising two wonderful children who are now young adults. Following graduate school, Dr. P-J worked for peanuts at the Jobs with Justice chapter in Eugene, Oregon, where she advocated for labor unions, saving the Postal Service, and blocking the TPP, working with a wide range of unions, environmental groups, social justice groups, and Occupy Eugene. 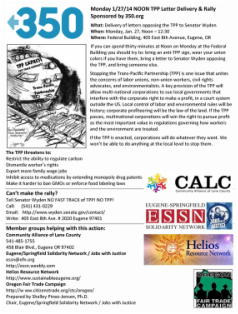 As an early opponent to the TPP, Dr. P-J helped deliver tens of thousands of anti-TPP petition signatures to the offices of Senator Ron Wyden, with Oregon Fair Trade Campaign and 350Eugene. At every union and other group presentation, she educated people about the dangers of the TPP, handing out hundreds of self-made flyers. In 2015, Dr. P-J relocated to Virginia to be closer to her children. It was there that Dr. P-J, a supporter of Hillary Clinton's first presidential bid, looked to Hillary for a definitive statement in opposition to the TPP. When, on June 15, 2015, Clinton said "let's take the lemons and turn it into lemonade," Dr. P-J finally recognized that the former Secretary of State supported the TPP and was therefore a tool of Monsanto, Walmart, etc. June 24, 2015, the day the Senate passed Fast Track legislation for the TPP, was a dark day for Dr. P-J. After a lifetime of social justice activism, including participation in every Democratic Party presidential election since Bobby Kennedy (when she was too young to vote), she threw in the towel. 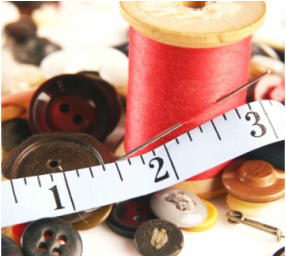 She started contemplating other long idle projects - sewing, art, Tarot readings . . . 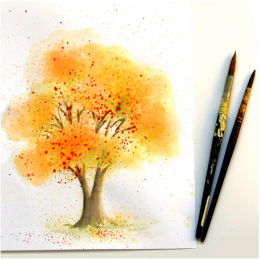 But hope springs eternal. The next day, on the morning of June 25, 2015, Dr. P-J woke up thinking, "I'm for Bernie." 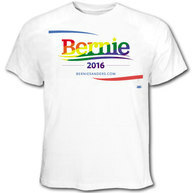 She ordered a rainbow Bernie shirt and started supporting his candidacy for president. And therefore, . . . Bernie Sanders for President! 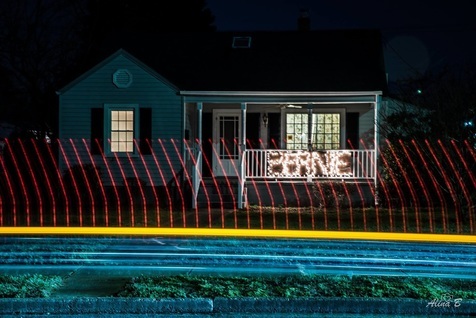 My Bernie "Light Brigade" sign made in December of 2015. I recognize that electing Bernie Sanders President is the best and quickest action Democrats and all voters can take to start solving the multiple problems confronting our nation and the world. There is no time left for status quo politics; we need a REVOLUTION. Climate change is the gravest threat; we need a carbon tax now. Corporatization of all aspects of human life facilitates the exploitation of human and environmental resources; we need a leader who is not a member of the oligarchy or its tool. My goal is to be a delegate for Bernie Sanders at our convention in Philadelphia to advocate for the policies that Bernie Sanders has outlined on his website: berniesanders.com/issues/. I joined the Fredericksburg Area for Bernie Sanders group in summer of 2015 and currently serve on our steering committee, attending meetings, taking meeting notes, and helping maintain our member database and FB page. I have helped host various events in support of Sanders, including debate watch parties, a “Barnstorm,” and organizing meetings. I helped gather petition signatures; we got Bernie on the ballot in Virginia. When that goal was accomplished, I tabled at University of Mary Washington, registering voters and recruiting volunteers. On primary day I was an authorized representative of the Sanders Campaign for the purposes of poll watching. I made and display a Bernie Light Brigade sign.